How much did you know about this condition before starting Love Anthony? Do you know anyone who has autism or an autistic person in their family? What significance does the setting of Nantucket play in this story? Would the story have been different if it had taken place in New York City or Chicago? Beth pulls a box out of her attic, filled with remnants from her old life, and is reminded of the woman she once was. If you were to go through a box from your attic, what items might you find? On the subject of marriage and fidelity, Beth’s friend Courtney muses: “You’re always at the mercy of the people you’re in a relationship with, right?” (p. 171) Do you agree? What do you think of the advice she offers Beth? Do you think the author accurately captured the voice of a young autistic boy in the Anthony chapters? Did these sections enhance Beth’s story for you?What about Olivia’s journal entries? After receiving David’s letter about his impending engagement, Olivia ponders the concept of happiness: “He’s right. I forgot about happiness. At first, it wasn’t a priority. Anthony had autism, and every ounce of energy went into saving him. Her happiness was irrelevant….And then, just when she was starting to realize that happiness and autism could co-exist in the same room, in the same sentence, in her heart, Anthony died, and happiness was no longer a concept she could fathom.”(p. 283) Do you think happiness is a conscious choice? Do you find it telling that Olivia uses the phrase “saving him” in reference to Anthony and his autism? Toward the end of the story, Olivia has an epiphany when she realizes that “There was more to Anthony’s life than his death. And there was more to Anthony than his autism.” (p. 283) What do you think finally enables Olivia to have this realization? Was it a singular event or a process? When Jimmy and Beth share their homework assignments given to them by Dr. Campbell, were you surprised by Beth’s initial reaction? Why is forgiving Jimmy the one thing Beth can’t do? After reading Beth’s novel, Olivia is convinced Anthony is speaking to her through Beth. Skeptical, Beth discusses the idea with the more spiritual Petra, who feels “we’re all connected, even if we don’t know how. Maybe communicating through you gives you the something you need in this lifetime.” (p. 308) Do you agree or disagree with Petra? Through writing her book, Beth realizes “this story was more about Anthony the boy than Anthony the boy with autism… she was simply writing about Anthony, a boy worthy of happiness and safety, of feeling wanted and loved. Just like her. The more she wrote about Anthony, the more she realized that she was actually writing about herself.” (p. 331) How so? 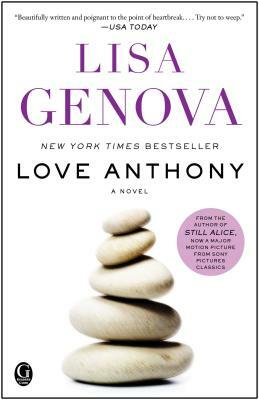 Beth ultimately decides the lesson of her book is “Find someone to love and love without condition.” (p.332) Do you think this could also apply as an overall theme for Love Anthony? Can you find any others? Which character did you relate to the most and why? Where do you see these characters in five years? What do you think of Beth’s epilogue? Do you think it provides a satisfying ending to her story? To the novel as a whole? Another recurring theme of Love Anthony is faith – having faith, losing faith, and taking a leap of faith. Can you remember a time in your own life when you took a leap of faith?